Winter boots come in all shapes, colours and sizes and the array can be bewildering. It makes sense to think about where you’d like to wear your winter boots before you part with your cash. Are you looking for practical winter footwear to keep your feet cosy and warm while dropping off the kids at school or doing the weekly food shop? Are you looking for boots which will make more of a style statement to accessorise a special outfit? 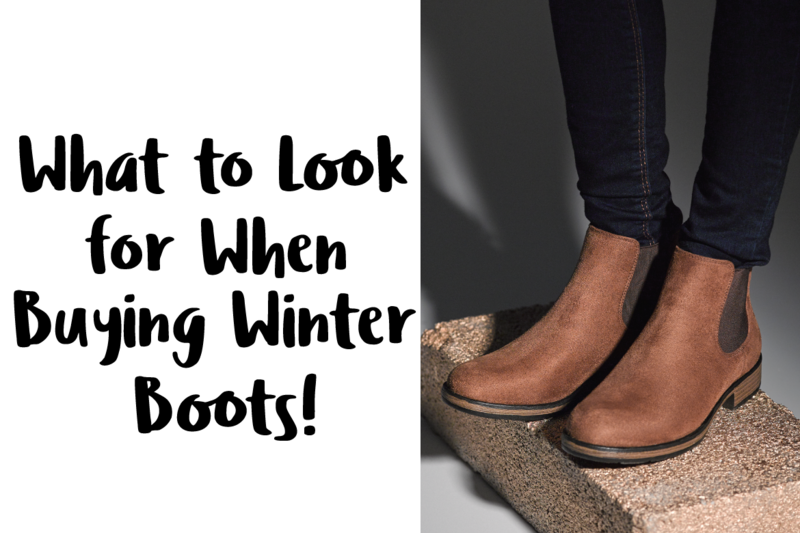 Are you looking for winter boots that will look professional enough to wear to work but still provide some protection from the ravages of winter weather? Are you looking for good value winter boots for the kids? If you want your boots to withstand the rigours of hiking in the snow and other winter sports, then you’ll need to look for something more substantial from a specialist retailer. But if you’re just concerned about keeping those tootsies toasty during the colder months, then winter boots are the way to go. Try them on with the socks you want to wear with your new boots as this can affect the fit. The best time to buy winter boots is later in the afternoon when you’ve been on your feet all day. This is when your feet will be at their largest. Make sure you try on both boots – it’s normal for feet to be slightly different in size so you want to be sure they’re comfortable on both feet. Take a walk around the shop (or your living room if trying on at home) so that you’re sure they’re easy to move around in. When can you wear winter boots? In our grandmothers’ day, this was an easy question to answer: when the weather gets cold enough! Nowadays it’s not as simple as the weather dictating when to start wearing winter boots. According to the fashion press, it’s always on trend to wear boots of some description! Summer shorts and miniskirts are often paired with knee high or over the knee boots. Mid-calf boots and swishy print dresses give you that retro 90s look. Bootcut jeans and cowboy boots are a classic combination that’s always in style. Typical British weather doesn’t help much either. Winter days can be surprisingly warm while spring and autumn can often catch us off guard with sudden cold snaps. It pays to check the weather forecast. Even air conditioned offices can prove somewhat chilly in the summer, turning fashion winter boots into suitable workwear. So when is the best time to buy winter boots? Most high street stores and online retailers start bringing out the next season’s designs at the end of summer, going into early autumn, and many will gradually add further lines as the autumn turns into winter. So if you’re searching for uber-fashionable winter boots, September is a good month to catch the first of the season’s new styles. However, if you’re in search of a bargain (and who isn’t these days?) then knowing when winter boots usually go on sale will be key. Keep an eye on your favourite shops – pop in or email to ask when stores start stocking winter footwear and when their women’s winter boots are on sale. After Christmas is the traditional time of course, but mid-season sales are becoming more and more popular. The true bargainista will know that spring and summer are the times when stores are looking to move any remaining winter stock before the next season’s goodies arrive, so there may be discounts galore. Heat is most quickly lost from our head and feet so it makes sense to buy a pair of winter boots designed to keep out as much of the cold as possible. Traditional linings include fur and shearling but these can be expensive. Synthetic substitutes such as Thinsulate are often used on more fashion conscious designs to provide lightweight but equally effective insulation. Check what materials the boots are made from (usually on a label inside or on the sole) for further information. You might be after the latest trend, but there’s no doubt struggling along in boots you can barely walk in is never a fashionable look. Think about how winter boots are supposed to fit: they should support your ankles and give your toes wiggle room so they’re not pinched. It’s also worth considering what size winter boots to buy: if you want to wear them with thick socks for greater warmth and comfort, then buying a size up might be a good idea. Not all winter boots are waterproof as a matter of course: those beautiful shearling boots aren’t going to do the job on slushy, wet days. Leather, especially when treated with a specialist spray, can provide durable protection along with classic good looks which last from season to season. There are plenty of synthetic alternatives on the market which will fit the bill too without having to splash the cash. Rubber soles are ideal for keeping out the rain and snow, but check what kind of grip the sole offers too. Bumps and crevices provide traction to make sure you’ll stay upright on slippery paths and roads. 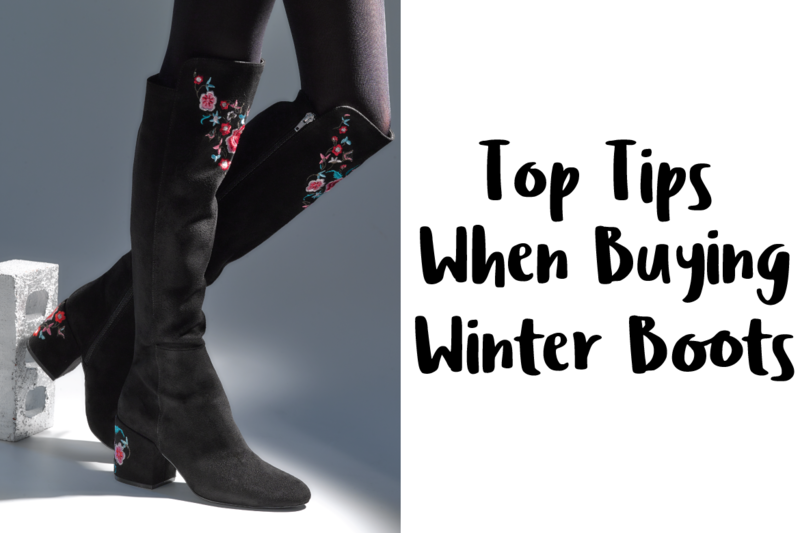 Different fastenings will affect how winter boots should fit. Lace ups will adjust to the shape of your leg if you are serious about walking longer distances in all weathers. 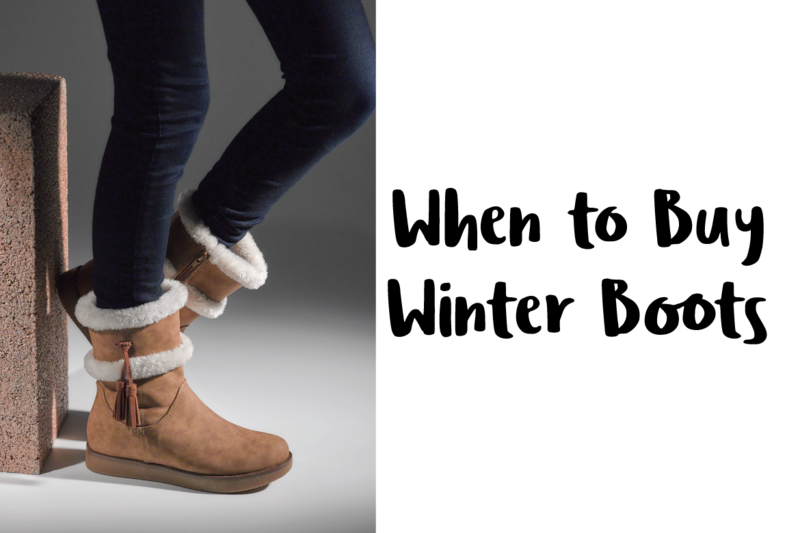 Many winter boots, though, rely on zippers for getting them on and off quickly and easily. Zip them up and down several times so that you know the zips are smooth, reliable and secure. Pull-on boots are even faster if you don’t have time to waste in a busy morning. Look out for elasticated panels in the sides. These stretch for ease of access but provide a snug fit once on, and they’re a must-have for any woman with wider calves. Men aren’t only looking for winter boots which will do a great job. There are plenty of sharp dressed men out there who also want to take design into account when buying winter boots. 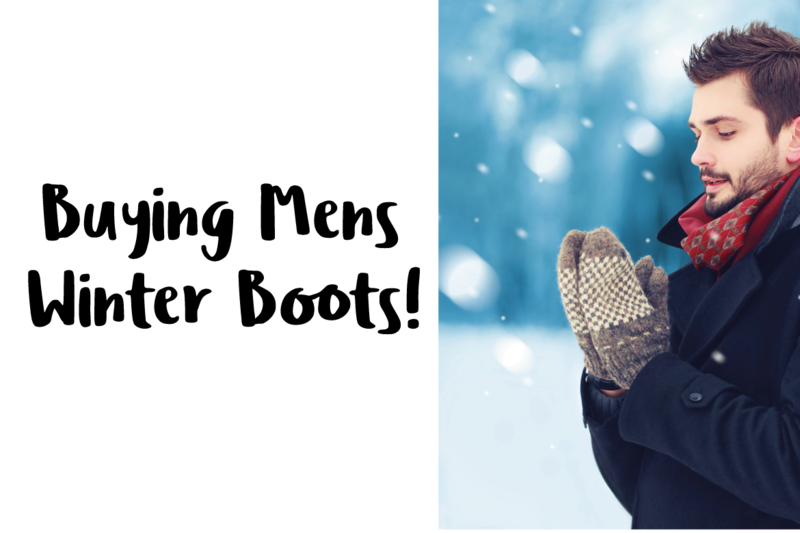 If you want to look super-stylish while doing the daily commute or taking the kids out for some fun, have a look at our top tips for buying men’s winter boots. Leather or leather-look uppers will provide a degree of waterproofing while giving the luxurious appearance of a dress shoe. Subtle seaming or brogue styling on the toe lifts the boot out of the ordinary. Dark colours ensure that winter boots for men are formal enough for business occasions. Make the most of the latest technology: try moisture wicking linings to ensure sweat is wicked away while warmth is retained. Rubber soles with tread are a no brainer, but they don’t have to be thick and obtrusive – less noticeable, thinner soles can be just as good at keeping out the winter weather. Pull-on Chelsea boots are a classic style that are quick and easy to get on and off and give a more casual look. Lace-up and desert boots will provide a more adjustable fit and give that rugged, sporty look. Don’t forget the dependable Wellington boot as an option for really messy activities. Here are our top tips for buying kids’ winter boots. Fit is of ultimate importance. Children’s tender feet are easily damaged so get them measured regularly and check for toe wiggle room when trying boots on. 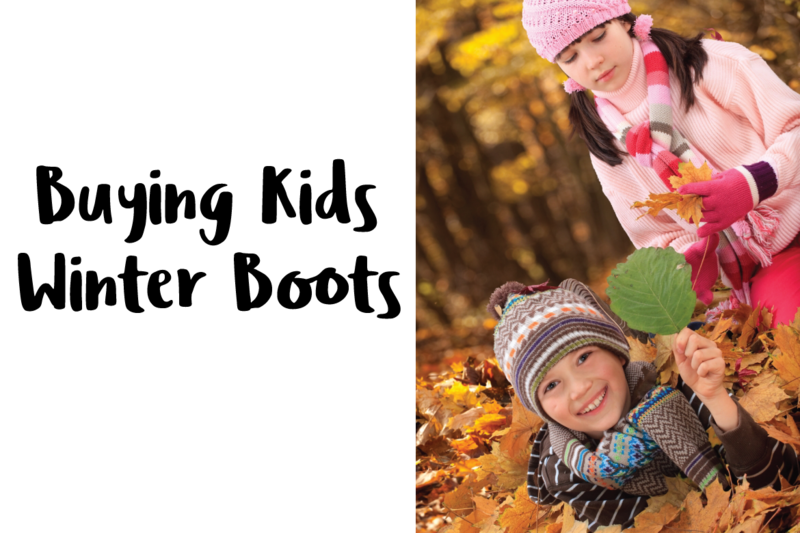 Try on kids’ winter boots with the socks they’ll be wearing. Go up a size if necessary to accommodate the extra thickness. Flexible, rubber soles with plenty of grip will ensure your active youngster doesn’t fall over too often in slippery conditions. Tiny tots will get frustrated if they’re running around outside in chilly weather and their feet get too cold. Keep those toes toasty with warm linings such as fleece or modern thermal insulation. Boot height is another important thing to consider. Ankle boots may let in too much rain or snow for busy little ones who find it hard to stay upright. Mid-calf or below knee heights are best and some boots even have a drawstring top to keep out the worst of the winter weather. Toddlers aren’t known for their patience, so make life easier (for you and them) by choosing an easy opening which will also help to build your child’s dressing skills. Easy fastening boots are your friends, as these allow for the boots to open wide but the flaps can be closed warm and snug in an instant. Is the stitching neat and tidy? Don’t be taken in by fabulous looks – have you inspected the sole and the lining? Are the soles securely attached to the boot? Are you happy with the price? Remember, a high price doesn’t always equal high quality, so check that you’re getting the best quality for the best possible price.